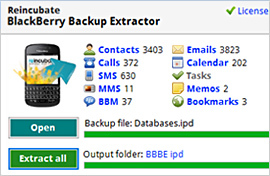 Open and extract BlackBerry contacts, emails, memos, call history, SMS, MMS, BBM and more from .BBB and .IPD backups. Get started with the free edition today and see what we can do. 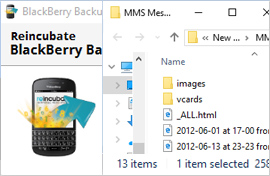 Any backup made by BlackBerry Desktop Manager is supported. See full compatibility. MMS Messages: Extract MMS Messages. IPD databases: Extract any data from databases. 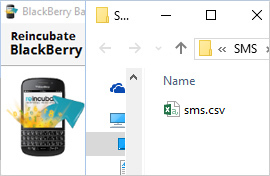 SMS Messages: Extract SMS Messages. 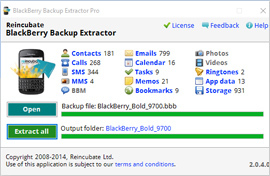 See what BlackBerry Backup Extractor can recover for you.